We can convert solar radiation into heat, e.g. for hot water, or into power. The amount of solar energy that reaches the earth is more than we could ever get out of all the fossil fuels (oil, coal, gas, etc.) on earth. The amount is also many times greater than the energy requirement of all the people on earth combined. For the Solar Energy project, the options for application on the Afsluitdijk are being investigated. A long strip of solar panels on/in the dam: that is a possible outcome of this sustainable energy project. The Afsluitdijk is a highly suitable location for collecting solar energy, among other things, because the light intensity in the north is greater than elsewhere in the Netherlands. Because of this, De Nieuwe Afsluitdijk is studying various applications of solar energy at the Afsluitdijk. We are currently still unsure how exactly we will be implementing the Solar Energy project. De Nieuwe Afsluitdijk’s ambition is mainly to gain more knowledge and experience with the large-scale application of solar panels. One of the possibilities is to have a long strip of solar panels along the motorway from Den Oever to Kornwerderzand. This will create a plant that produces power on a large scale. Based on two rows of solar panels over the entire length of the dam, the power generated could be around 6.5 MW. That is enough power to supply no fewer than 1500 households. Whatever it will look like, we should always take into account the effects on the landscape and the safety of the road users (e.g. dazzling). To ensure that the panels fits into the environment, several variants have been investigated in the Preliminary Visual Quality Master Plan. In addition, we are investigating if it is possible to fit a sustainable power supply to the Monument. 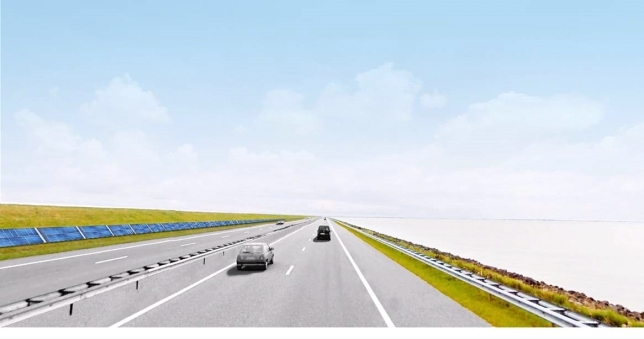 We are also investigating the options for constructing a special cycle track on the Afsluitdijk, known as a SolaRoad. Solar panels are built into this cycle track, as a result of which the road surface literally generates (solar) power. This application is currently being tested in Krommenie. If the results are positive, we will investigate if we will also be applying this in the cycle track on the Afsluitdijk.